Friends! As you know I'm currently taking some much needed mommy/baby/daddy time after the birth of our little one :) Aggg guys, we're parents!!!! So during this transition into our new season of life, I've invited some of my most beloved and dear blog friends to help me out, in the form of unique and wonderful guest posting! Today, I'm honored to have Abby of Little City Adventures take over. Hello Sweet Lavender Bake Shoppe friends! My name is Abby and I blog over at Little City Adventures. I blog about everything from motherhood, to original recipes, to home decorating and everything in between. My family and I (consisting of myself, my husband, Seth, and our son, William) have recently moved from Lancaster, Pennsylvania to Lititz, Pennsylvania about a 15 minutes difference. We didn't move far but the big change is that we now own our own home rather than renting. So lately on my blog you will find a lot of home decorating and home improvement DIY tutorials as we decorate and update our home over the next year. Now that I have a kitchen that I can update and design myself, you will find lots of kitchen organization posts along with original recipes. Hop over and say hello! When I was on maternity leave for my blog last summer, Christina was kind enough to share a guest post on my blog so I was more than happy to help her out during her maternity leave. 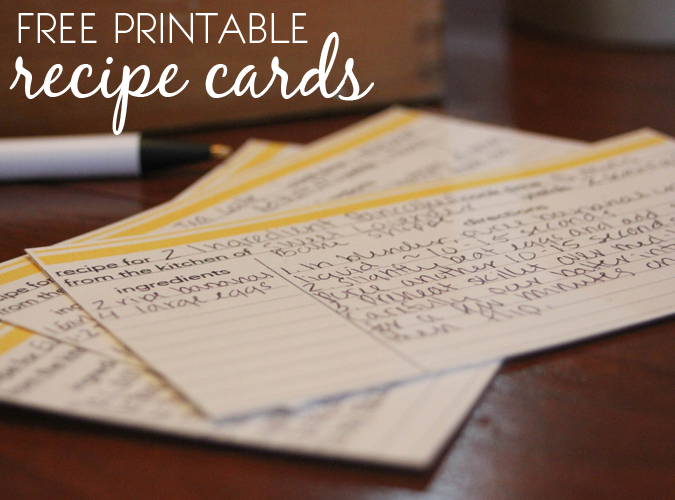 In sticking with the delicious food theme here on Christina's blog, I decided to create some printable recipe cards for you guys to write out your favorite Sweet Lavender Bake Shoppe and Little City Adventures recipes! You can choose from three different colors: blue, yellow, and coral. Or you can download all three if you'd like! Click here to download the blue recipe cards. Click here to download the coral recipe cards. Click here to download the yellow recipe cards. If you use these cards be sure to take a photo and share it using #littlecitycrafts!! Thank you so much Abby!! These are just the cutest! For delicious recipes, fun DIYs and more on motherhood please check out Little City Adventures!